We have been talking about the new features of Android 4.4 KitKat. Yesterday, we analyze the new media capabilities, such as screen recording, loudness enhancer and resolution switching through adaptive playback. Today, we are going to focus our interest in the new types of connectivity: new Bluetooth profiles, IR blasters, and Wi-Fi TDLS support. New Bluetooth profiles. The Android 4.4 KitKat supports two new Bluetooth profiles to let apps cover a broader range of low-power and media interactions. The first one, Bluetooth HID over GaTT (HOGP), links apps with low-power peripheral devices (such as mice, joysticks, and keyboards). The second one, Bluetooth MAP is designed to exchange messages with a nearby device (as a handsfree to be used inside a car). This protocol is also used in the automotive industry (Ford y BMW) to send commands between the different panels inside the car. IR Blasters. Android 4.4 KitKat finally supports IR blasters. It’s a long waited feature, as most of the other mobile companies – such as Samsung, LG, and HTC – already have it enabled in their devices. However, Android’s new IR blaster supports only one action: it can transmit an IR signal, but it cannot receive one. This means that that you will be able to use your phone as a remote control for TVs, switches, tuners, and other electronic devices. Unfortunately, the Android cannot really communicate, as without the possibility of receiving signals, the system cannot learn or record. However, it’s a good thing that the IR blasters are here! Wi-Fi TDLS. 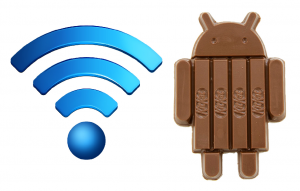 Android 4.4 KitKat introduces a seamless way to stream data between devices already on the same Wi-fi network by supporting Wi-Fi Tunneled Direct link Setup (TDLS). It’s really useful for exchanging documents with high efficient performance. TVs, smartphones, printers, cameras, and PCs can easily sent files between them. We can finally stop sending files to ourselves to have them in the tablet and the PC! You can find more information at Android Developers.